Those who know the Hospital Sisters of St. Francis understand their gift of Franciscan hospitality. To some, it is the welcoming spirit, and to others, it’s all about the delicious food that’s offered on their behalf. This month, we salute one of our chefs - Sister Mary Ann Vogt - whose hands have nourished the appetites of thousands of people. On a farm in rural southwest Effingham, IL, Clem and Josephine (Feldhake) Vogt raised their family of eight, including their oldest daughter, Mary Anna, who was born on February 16, 1922. A nearby one–room grade school was where Mary Anna received her education of reading, writing, and arithmetic, while her education on life and domestic duties was taught at home. The Vogts were members of St. Anthony’s Catholic Church, Effingham. And in the church’s genealogy, the Vogt name is listed among the first families who instituted the parish in 1858. As a teenager, Mary Anna understood hard work with chores on the family farm and for the house, along with working at St. Anthony’s Hospital, Effingham. It was here at the hospital where she was influenced by the example of the Hospital Sisters, and in 1944, she made First Profession of Vows at St. Francis Convent, Springfield. She took the religious name Sister Clement and later changed it to Sister Mary Ann. Over her 66 years in our community, her efforts have nourished us and countless others through the vital work of food service in Monroe, LA; Green Bay, WI; Shreveport, LA; Lukachukai, AZ; and Highland, IL. 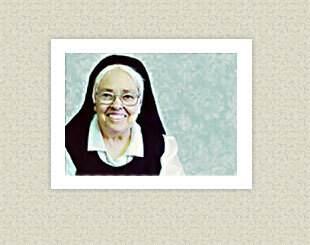 In addition, she served in Food Service at the Motherhouse and our Franciscan Apostolic Center. Before returning to the Motherhouse in 2000, she served at St. Anthony’s Memorial Hospital, Effingham, at the Information Desk. Being back in Effingham these years also enabled her to care for her aging mother. When asked about Sister Mary Ann’s work ethic, the Sisters unanimously give credit to a woman who worked hard and long hours in preparing, with assistance, three meals a day for small groups to groups of several hundred…365 days per year. In life, it’s easy to take things for granted. We therefore recognize our Sister Mary Ann whose tireless efforts, commitment to service, and gifts have been a blessing to so many for so long. Bon Appetite!